Many young boys who have been to see the hit musical Billy Elliot in London would love to play the role of the miner’s dancing son. For most of them, however, this will remain a dream, for only the most talented young dancers and actors are chosen to appear at the Victoria Palace Theatre in the West End – after going through a long audition and training process. Harrison Dowzell is one of the chosen few. 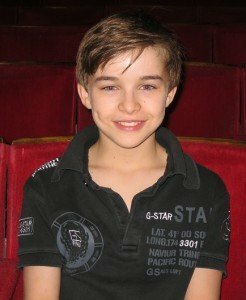 The 12-year-old dancer from Nottinghamshire, who loves Street & Hip Hop and is also a keen footballer, became the 30th boy to play Billy in the West End and made his debut in May 2012. He has been wowing the audiences two or three times a week ever since and enjoys every single performance. Despite his very busy schedule, Harrison kindly answered a few questions about himself and his career. I’m sure you’ll enjoy this brilliant interview! When did you first realise that you wanted to dance and act? I realised I wanted to dance when I was about 8, I loved watching dance movies and used to teach myself before I took lessons. The teachers at my junior schools noticed I had a natural talent during dance in PE and mentioned this at parents’ evening. You joined the Rollo Academy of Performing Arts and also Freedom Movement at the age of 8. Please share a memory or two of your time there. I had a great time, I took some exams and did some competitions and loved the different varieties of dance I was doing. I made loads of friends. When you were only 10 years old, you won a talent contest: The Vale’s Got Talent. You performed a Hip Hop dance routine to Mike Posner’s ‘Cooler than me’ and wowed the judges. Can you tell us about this experience? I always danced in talent shows at school so thought I would try my luck. I was going to do it with some friends but they already had a routine and I really wanted to choreograph my own so ended up doing it on my own. I had an audition, then got through to the semi-final with a dance I made up and then when I got to the final I decided on ‘Cooler than me’. I choreographed it whilst on a weekend break with my family. I was very proud when they announced me as the winner as it was all my own work. The money went towards further dance lessons as it was around this time I saw the audition poster for Billy!!! So you were really into street and hip hop – how did you end up playing a boy who loves ballet and is really really good at it as well? One of the older guys at my dance schools suggested I take up ballet lessons, he did ballet and I looked up to him, he was amazing and went to Bird College. I was a bit reluctant at first being a late starter so arranged some private lessons at Rollo in the run-up to my audition for Billy. I found it really tough and sometimes still do, it is probably the hardest of all but I like the challenge and work hard at it and now I love it. 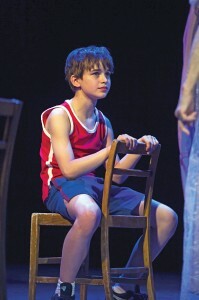 You are the 30th boy to play Billy Elliot in the West End. How did you feel when you found out you’d got the part? 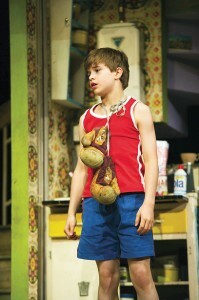 I came back from the summer school and felt I had done my best and really hoped I would be chosen to play Billy. About 4 days later my Mum got the call to say I had been chosen. I was asleep and she woke me up saying “Good morning, Billy”. I was so happy I cried. I had achieved my goal, such a great feeling. What did your mates at school think when you landed the role? My close mates were really supportive and congratulated me. Some don’t really understand and keep asking me if I’m still in Oliver! Or doing the pantomime. Those that have been to see me just love the show and a couple of good friends have been more than once!!! Your parents must be so proud of you! You dedicated your first night to your family who have always supported you. How does Billy’s situation make you feel, when his Dad and brother don’t want him to pursue his interest in ballet? Yes, my Mum and Dad spent a lot of time taking me for lessons and were really supportive. It makes me cross when I’m Billy that Tony and Dad stand in my way. Can you identify with your character ‘Billy Elliot’ or is your personality completely different? Yes, I watched the movie and show and I’m very similar in the way that I was a footballer and he was a boxer (I used to turn up to dance exams with muddy legs from a match!!) and we both found kind of by accident that we loved the passion of dance and the feeling it gives us. I identify with the Shine scene, it reminds me of my first lessons in real life. What’s your favourite song in the musical? Kings because of the emotion. How many times a week to you play Billy? It must be very hard work? Two or three times a week, it is hard work but I love it. How do you like living in the ‘Billy House’? It’s great! I really miss my family at home but I’m really happy at the house, it’s so homely, we have great food, the house parents are cool and we are like one big Billy family. Could you describe a typical day in the life of a Billy actor? We wake up and have breakfast together. Then it’s school until lunchtime most days. We have lunch and then go off to our calls or the theatre, it’s different each day (acting, ballet, tap, singing, acro, etc. etc.). If I’m offsite rehearsing or having lessons then I get back to the house about 8.30pm for supper. If I’m at the theatre it’s obviously later. Sometimes the kids at the theatre get taken out to Wagamama’s or Nando’s as a treat. What’s it like backstage at the Victoria Palace Theatre? Good fun, we have a laugh as well as working hard. How do you feel about being recognised by fans, signing autographs and being photographed? I really enjoy it, I remember recognising Scott when I first watched the show and I wanted to tell him how good it was. It’s good to get the feedback and talk to fans. Are there any funny Billy stories you’d like to share with your fans? Maybe something unexpected or even embarrassing has happened to you on stage? Nothing funny or embarrassing, yet!! Have you got any role models that you aspire to be like? I have a few role models and would have to say Gary Oldman, Daniel Radcliffe, Ashley Banjo who came to watch one of my shows the other week, I couldn’t believe it. Apart from my mates in Billy of course, I would love to dance with Ashley Banjo. 10 years from now – what would you like to be doing? I have no idea really! Seriously, I love dancing and acting and hope to carry on. I used to want to be a PE teacher but I’m just not sure at the minute. Have you got time for any hobbies at the moment? I love music so am always listening on my Ipod. I’m into scootering and like watching parkour and freerunning but am not allowed to do it whilst in the show. I also like learning card tricks. You used to play football for Notts County FC. Would you like to play football again at some point? Do you support a premiership team? No premiership, just Notts County!! Please tell us about ‘Rocky the Persian cat’! Mum got him as a surprise for me and my brother. I named him after Rocky Balboa! Though he isn’t tough at all! He’s really furry and really daft, he likes to catch leaves in the garden. He sleeps on my bed when I’m not at home. Is there anything else you would like to add? Maybe a message to your fans? I would just like to thank everyone for their support. Dream Believe Achieve is my motto! Many thanks for your time, Harrison! Keep up the great work and all the best for your career.